At LUX* Maldives, the streets are paved with silky sand. Not just the pathways, but the major intra-island thoroughfares…across the ocean. 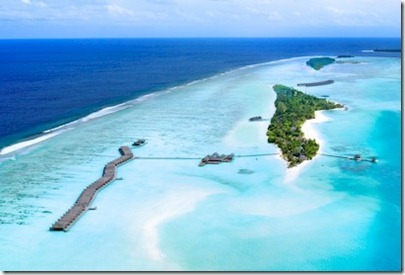 During low tide, one of the longest sandbanks in the Maldives connects LUX* to the neighbouring local island of Dhigurah (the sandbank is in the middle of the bottom of the picture above and Dhigurah would be further down below the edge of the picture). Guests actually need to avoid temptation of crossing it (there is a sign asking guest not to pass) because the local island is Muslim and things like women in bikinis are preferred kept in the resorts. Also, if guest loses track of the tide, then they can be stranded. But, a number of workers are from the island and walk across the isthmus land bridge to work at times.